The Fellowship was fortunate enough to obtain a copy of POSTAL #1 from Image Comics and Top Cow Productions. Bryan Hill and Matt Hawkins write, Isaac Goodhart draws and Betsy Gonia colors. Eden, Wyoming is a last-chance town for criminals, and Mark is the mailman. That puts him in position to know a lot about the townsfolk, and his Asperger’s makes the info stick with him. His mom is the mayor, and when people do bad things, they are dealt with harshly (hence the last chance). So when Mark finds a murder victim, things in town start to get very tense. Mark is an interesting candidate for a detective; his condition makes him very good at seeing patterns. That the town is full of criminals doesn’t help, though. This is a cool twist on a classic whodunit, and Mark’s narration is pretty insightful. The art is very clean, and I like how the muted colors lend to the idea that we’re seeing this from Mark’s perspective. If you think you might like a well-written murder mystery, this is the book for you. I know I’m hooked. 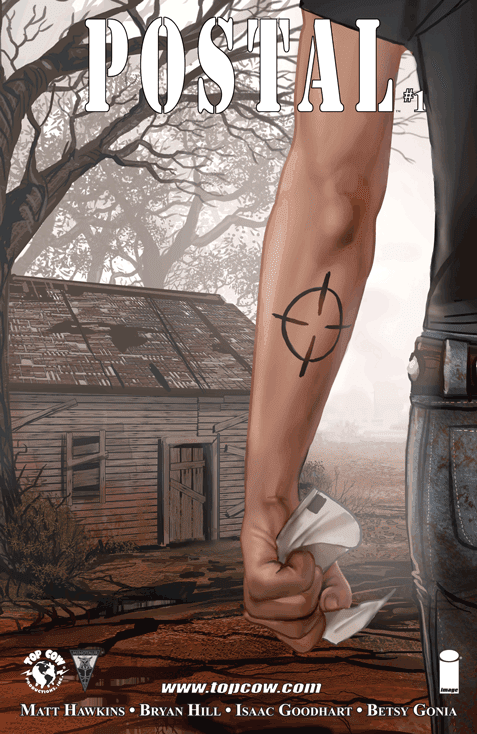 POSTAL #1 is available now at your FLCS or at imagecomics.com.